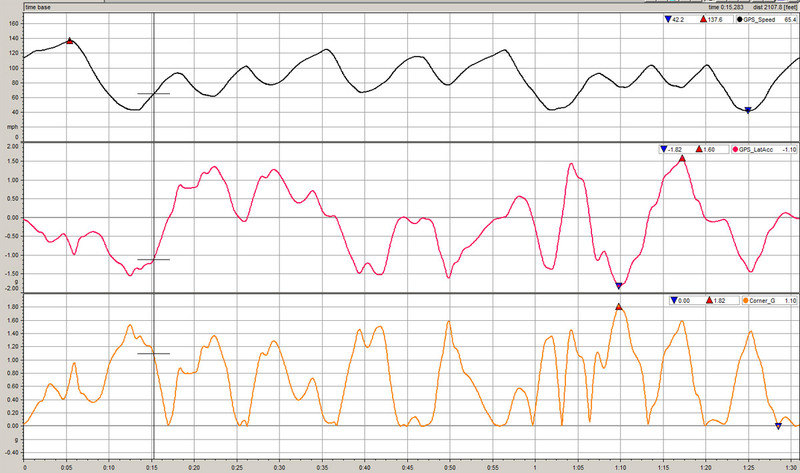 Figure 1: Data from Mazda Raceway Laguna Seca, with GPS speed in black. In the middle, the lateral acceleration channel is shown in red. 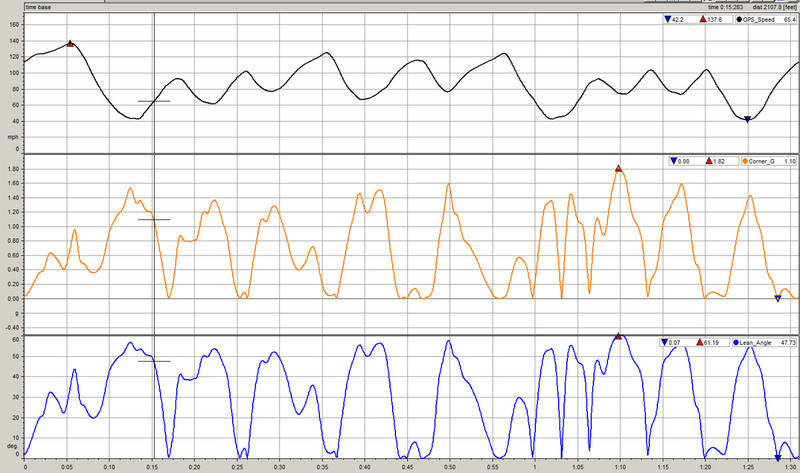 At the bottom and in yellow, the lateral acceleration channel is modified to show all positive values for cornering. Where abs () is the absolute value function. Your software package most likely includes the abs function, but some creative addition and subtraction can yield the same results. 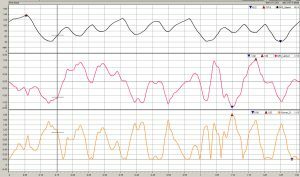 This channel is shown in Figure 1, using the same data as used in the previous braking G and acceleration G examples. Again, it is easier to pick out various characteristics using the Corner G channel such as maximum lateral acceleration in each turn as well as how quickly the trace ramps up to a maximum or trails off at the exit of each corner. Note that GPS lateral acceleration must be used for this formula to be effective (rather than acceleration as recorded by an in-unit accelerometer) and that some software will give trigonometry results in units of radians rather than degrees. The formula as shown will give a positive result for right-hand turns, a negative result for left-hand turns. An option is to use an absolute value function in the formula to always give a positive result, or to use the corner G channel instead of lateral acceleration; this will make the resulting graph easier to evaluate. Your data acquisition software should be capable of all these functions. GPS_LatAcc is Aim’s channel for GPS lateral acceleration. This lean angle math channel includes the abs function to make all values of lean angle positive, and a correction factor to convert from units of radians to degrees. Figure 3 shows the lean-angle trace for the same lap of Mazda Raceway Laguna Seca shown in Figure 1. Knowing lean angle does not in itself provide much information, but the trace is very useful. For example, corners on the track where lean angle is significantly less than the maximum value will require attention. Perhaps the racetrack is cambered or downhill, or the pavement is particularly bumpy. We can also see areas where the rider lifts the bike midturn, and these are likewise areas of concern. While it is possible to more accurately find lean angle by using an elaborate formula that takes into account tire size and center of gravity height, for these purposes our simple formula is accurate enough. Figure 3: This chart shows the same lap used in figure 1 with speed in black and corner G in yellow. The lean angle channel has been added, in blue Note that we chose to always show lean angle as positive, making it easier to read the graph. This requires an absolute value function in the equation. Another use of lean angle is to find further data using more math channels. 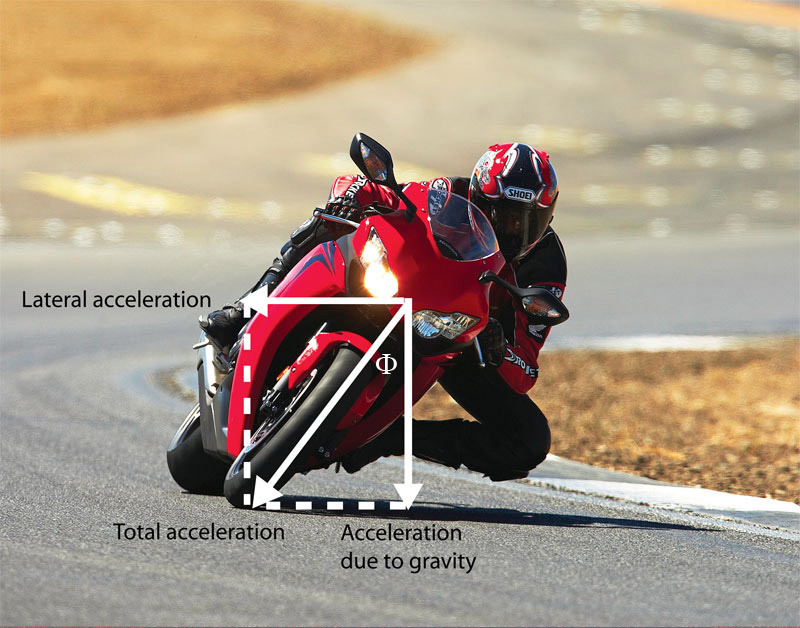 For example, note in Figure 3 where the rider leans the bike from side to side: lean angle dips to zero and then increases again, preferably to maximum lean. 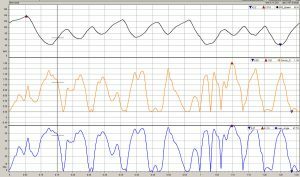 These transitions represent how quickly the rider can turn the bike from side-to-side, and differentiating lean angle using another math channel will put numerical data to this aspect. This will be shown in a later section, but note for now that again, knowing the actual lean angle is not the critical component. Note how the corner G channel is similar to the lean angle trace in its basic shape. Using two channels may seem extraneous, but there is good reason: Lean angle is easier to visualize (especially for the rider) rather than corner G, but the latter channel has units matching those of the other acceleration channels and can be combined with the longitudinal acceleration channels to see yet more detail.